Went to see Midnight in Paris last night and enjoyed it very much. I had heard a lot of good things about it from people and it certainly lived up to expectations. Getting to see some of the past greats like Ernest Hemingway, F. Scott Fitzgerald, Pablo Picasso, T.S. Eliot and everyone else in a modern film was certainly a treat. 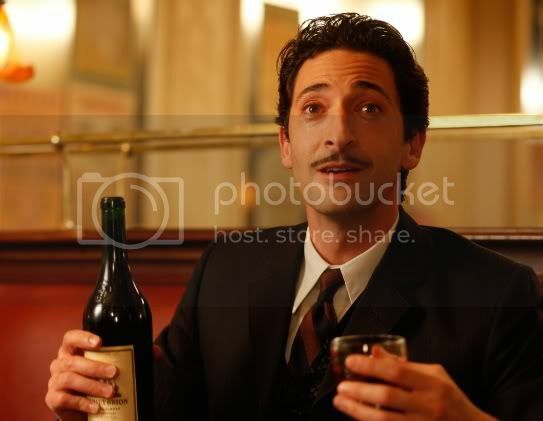 I was especially impressed with Adrien Brody's portrayal of Salvador Dali. As you can tell if you've read this blog much at all (or even looked at my previous post), I've been involved in closely studying Dali's life and work for a little while and so I was glad to see him get such a nice portrayal in the film, especially from a big actor like Brody. In all honesty, I can be a harsh critic with this kind of stuff, especially when it deals with something I've spent so much time being involved with, and I genuinely really enjoyed Brody as Dali. In fact, he may have been the best character in the entire movie (though Ernest Hemingway was certainly really good and the laughs in the theater certainly attested to that). The one thing that bothered me, of course, was the absence of James Joyce. His name was mentioned in an anecdote very early in the film but through all the adventures the main character had with the big figures of 1920s Paris, we never got to meet Joyce. This was really disappointing because I know his character would've stolen the show, just as the real Joyce did within that rich artistic environment. The Joyce of the 20s was also perhaps the one best suited for big screen portrayal; he had the eye patch at that time, the great fame from having just published Ulysses, and was in the midst of his greatest (and most baffling) work of all, Finnegans Wake. And the biographical books are certainly filled with his wild carousing with the likes of Hemingway who had a relatively huge role in the movie. I wonder if there were Joyce scenes that were cut out that might be included in a future DVD set. I'm really interested to find out because I thought Woody Allen handled all these old famous figures extremely well. While my girlfriend and I were getting ready to go see the movie, I reflected on how for decades and decades couples were in that same spot, getting dressed for a night at the movies to see "a Woody Allen film." It struck me for a reason I can't quite elucidate (eternal recurrence through the ages, perhaps). I've never had any real interest in Allen's films before and, really, I can't name a film of his that I particularly enjoyed. I know of Annie Hall but haven't seen it, and the last time I started to watch a Woody Allen movie I found the whiny arguments so grating I had to turn it off (admittedly, Whatever Works starring Larry David was not bad). This movie was completely different and, really, there wasn't much indication that it was a "Woody Allen" film. The director managed to stay out of his work, as in Joyce's description of the dramatic art form: "The artist, like the God of the creation, remains within or behind or beyond or above his handiwork, invisible, refined out of existence, indifferent, paring his fingernails." Speaking of directors, God, and creation, I have to say a few things about Terrence Malick's Tree of Life. As I wrote a few months back, the trailer for this movie captivated me and the scope seemed to perfectly fit my current mindstate. I dragged my uninterested girlfriend to a packed theater on the first night it was playing here in Austin and after nearly three hours of completely unconventional cinema, I was left in a daze. She absolutely hated the film and it doesn't surprise me that it has evoked similarly strong reactions from the public on each side of the pole. To put it bluntly, the style of the film does not make for a palatable cinematic experience. One has essentially no idea what they are watching from beginning to end. The dialogue is minimal and most of the talking we hear is in hushed whispers. What we encounter is a collage of memories, moments, seemingly personal explorations of the unconscious. Whose unconscious it is, we're never really sure, but it seems to be that of Sean Penn's character as he goes about his work day and experiences a sort of crisis within himself. I had expected the scenes showing the Big Bang and the creation of the universe to be special and indeed they were. My problem with it is that they seemed to leave something out, as we didn't get any kind of transition from all of that to the small-town Texas family. It was just a bunch of cosmic creation, formation of planets, life, etc and then a cut back to the family scene. While the point ("we are walking manifestations of the history of the universe") seems clear enough, I don't think the delivery of it was well executed. Nevertheless, an extremely admirable and ambitious idea. I don't want to offer a firm judgment on the overall quality of the movie because I've only seen the film once and really didn't connect with it the way I expected to. That doesn't mean I think it sucked, it certainly left me in a blank daze for a while afterwards, but that may have just been due to the aforementioned tender onslaught of sights and sounds which can be hypnotizing in a way. I think I'd like to give it a look one more time and then decide how I feel about it. It's certainly sending some of our cinema scribes into a state of spiritual serenity. With my recent studies on paranoia (and my own occasional feelings of impending doom within this crumbling American Empire) this one seems right up my alley. Plus those are some pretty strong endorsements included within the trailer. Very interesting post. I do want to see Midnight in Paris, though I get to movies pretty rarely these days. I have also heard good things about it. I am surprised Joyce wasn't in it,but I'm glad for you that Dali was. Good for Adrian Brody. We went to Tree of Life for a belated Bloomsday outing a week and a half ago. I wrote it up on the Finnegan blog because it was with the Finnegan group--other than that I didn't see a huge connection. It was a very odd movie going experience as you say. I thought the little film--minus Sean Penn, minus the cosmos, minus the dinosaurs was very strong and could have stood on it's own, but it may be that the kind of larger dimension is what made that part feel so intense. I've read someone else post a comment that it didn't do much for him in the moment but messed with his head for quite a long time after. One thing that I felt with the movie and haven't really seen said elsewhere is that in my secret self I found the cosmos boring. It seems very ungrateful, but there it is. It's an odd thing to say about the cosmos--been there, done that--but the images don't take my breath away anymore in the way I somehow feel they should. Star Wars, Star Trek, the Hubble images and everything must've spoiled you. I still get that feeling of the sublime when looking at images of the cosmos. It was also cool to see it all in ACTION in the film (with dramatic music to go along with it). Not just still shots but scenes where the Milky Way, the Sun, the solar system, the earth were actually coming into form. That was cool. Yes, I have to say I was kind of surprised at my own reaction.